levels that resemble a pyramid, and representing what a responsible dog breeder's foundation should be. This applies to breeders of standard as well as breeders of Disqualified colors. immediate need and first focus for your dogs. and better quality dogs and improving upon conformation, health, temperament in your own breeding program. You are thinking of future generations and concentrating on producing quality for many years to come. have the same success as the breeds that have been bred for consistency for many centuries. 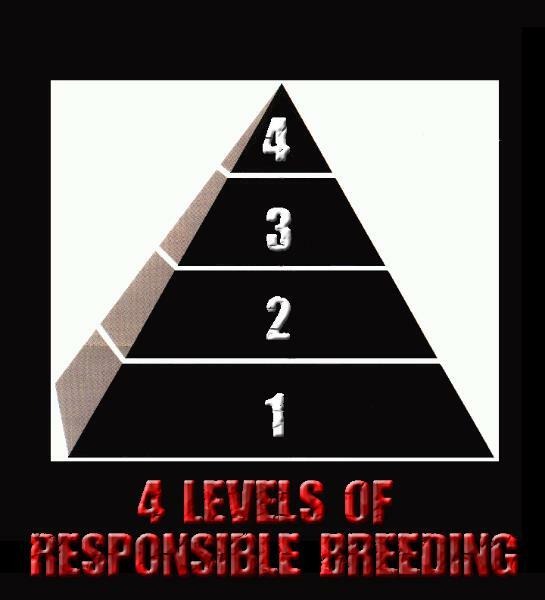 Ideally in every breeding program, all four levels are in place. However that is often not the case. Puppy mills rarely, if ever, have the first level in place for their foundation. stuck at this level without ever having a higher purpose than money or their own enjoyment. themselves on what to look for and how to produce it. This level is their commitment to quality. paradigm outside of their own wants and needs.